Souliyahn Keobounpheng was born in 1970 in Vientienne, Laos and came to Richfield, MN in 1979 via a refugee camp in Thailand. This abrupt shift in environment and circumstance, at an impressionable time as he approached adolescence, continues to permeate his view of society, culture and creativity. Souliyahn’s approach to life, art, and design is deeply rooted in the spirit of play, tied to the process of making and manufacturing, and committed to the reuse of discarded material through making art. This new collection of six paintings [titled “Art (of) Work”] intends to capture the art involved in producing creative work. 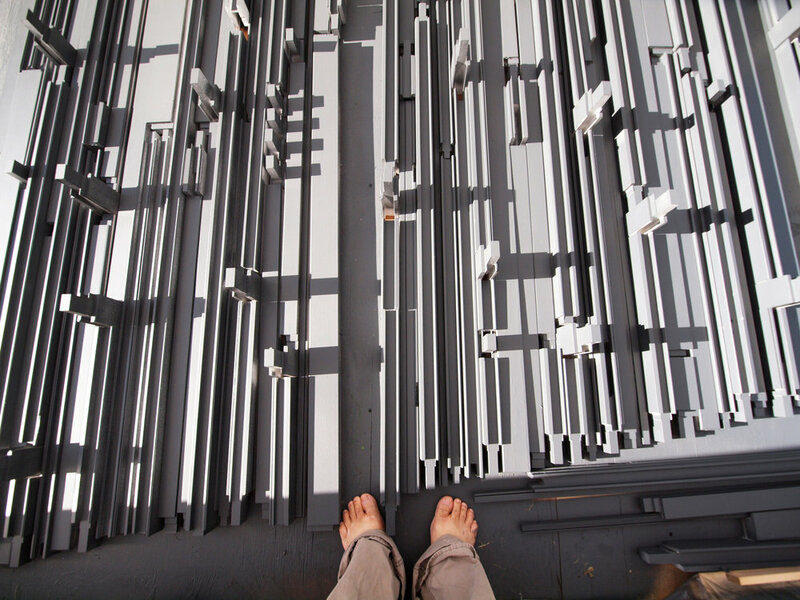 In 2014, Souliyahn built a temporary work-tent in the yard in order to process salvaged window-parts for several sculptural wood-wall installations. He structured a floor for the tent using 2x4s topped with 4x8ft sheets of plywood. Over the following months he used the tent to compose the wood and his apprentice primed and painted the pieces to be ready for installation. At the end of the season, after the installation was complete, the tent and floor were dismantled. The sheets of plywood from the floor that recorded the process of multiple projects have now, in turn, been framed as their own project. The random patterns, marks, and layers of residual work captured organically gets to the heart of intentional and unintentional creative human activity and the artistic beauty that exists all around us - if we take a moment to see it. Each painting measures 4ftx8ft and is framed with clear pine wood and a 2x2 back structure. Six paintings in all, each is original.